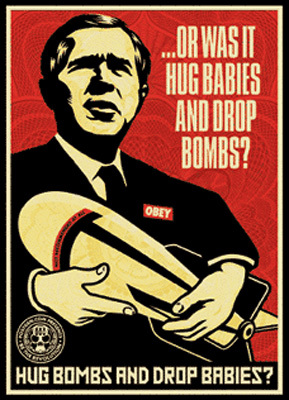 The new Bush poster is part of a 3 poster series by Shepard Fairey, Mear One, and Robbie Conal. The posters are 24"x 36" signed heavy paper offset prints limited to 250 of each. All money from these posters goes to benefit anti-Bush/war efforts. 4"x 6" stickers of the poster images are also available. This print originally sold for $40. A paster version of this graphic was also produced.